I’ve always been a breakfast person. French toast, waffles, eggs, potatoes, pancakes; I enjoy them all. Sometimes, in fact, I would like them all at once. Because of my love affair with breakfast foods, I have developed some pretty liberal ideas about when they should be served. Brunch is a great idea of course, but I also happen to think huevos rancheros make a fine dinner. And those restaurants with the round-the-clock breakfast menus? Those are some of my favorite places. During the growing season, my work day usually starts before sunrise. I love the early hours, but they seem to go by too fast. Often, I’m juggling a couple of different jobs, scrambling to get things done here in the office or out in my garden, and running off to appointments with landscape design clients. I don’t have time to sit down for a leisurely morning meal. So when I have a free weekend or morning off, I treasure the opportunity to create an old fashioned breakfast or relaxing brunch. And at this time of year, I especially enjoy cooking with fresh, early-spring produce —mushrooms, arugula and fiddleheads— from the garden and surrounding forest. The woodland mushroom garden began as a small experiment here, but has since blossomed into a full-blown production. There are so many mushrooms popping up right now, that it’s probably time to start selling them. 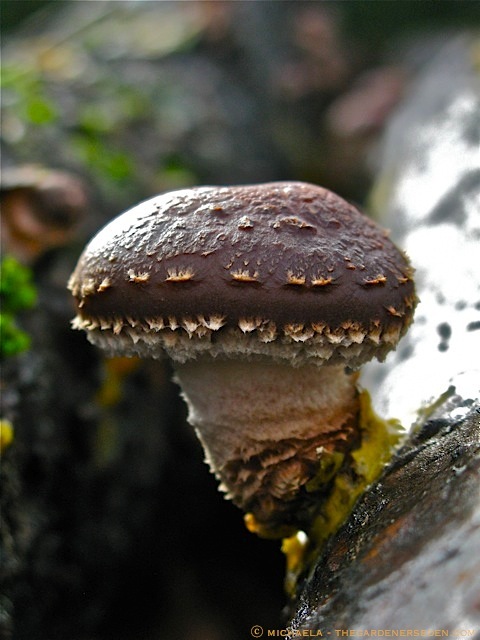 Shiitake mushrooms are surprisingly easy to grow, and early-spring or autumn is the best time to begin a mushroom garden of your own. 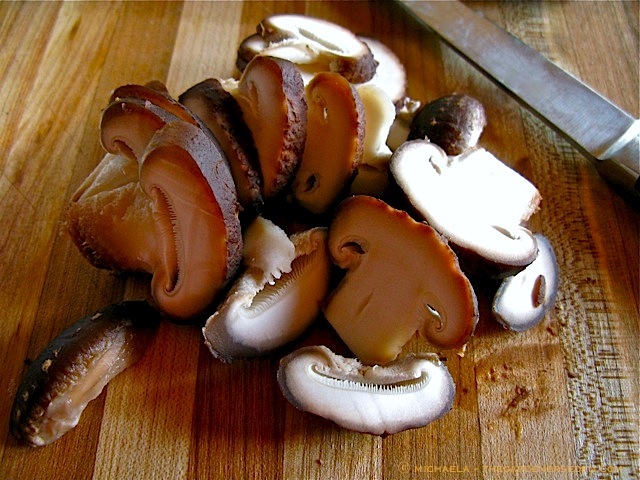 Wonderful when harvested fresh in spring and fall, shiitake can also be air-dried and stored for later use (soaked in water or wine they are easily reconstituted for use in myriad recipes; including soups, sauces, pasta and rice dishes). 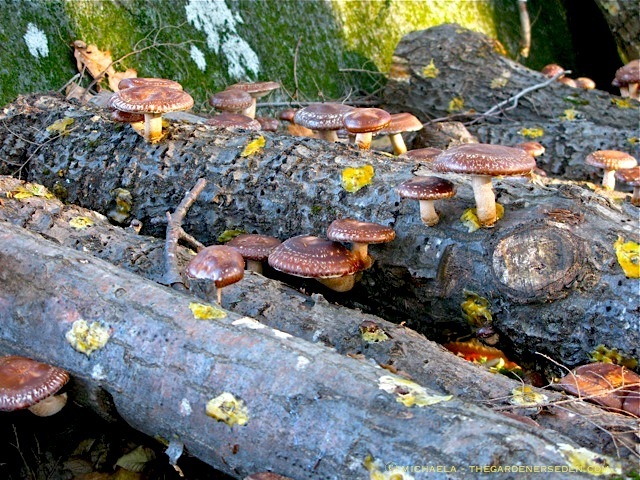 If you are interested in how shiitake are grown, travel back to last year’s post —by clicking here— for a step-by-step tutorial on the process. Of course, I have plenty of space for full-sized mushroom logs here. But if you enjoy cooking and eating mushrooms, growing them is within the realm of possibility for any gardener; even one with very little, or no outdoor space. 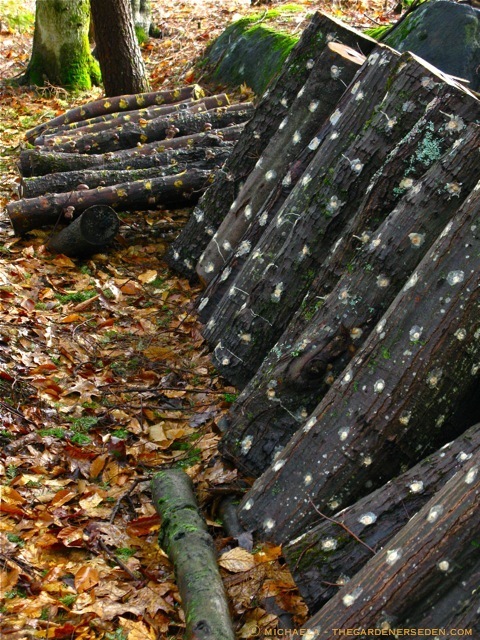 Small, pre-inoculated mushroom logs can even be purchased online (in season) from retailers like Gardener’s Supply Company and Terrain. There’s nothing like the taste of fresh mushrooms, and with the cost gourmet food items like shiitake, it’s really worth your while to start growing your own! With a basket full of fresh shiitake and fiddleheads from the forest –and of course baby arugula from the kitchen garden— I had plenty of delicious produce for my late-morning breakfast today. I decided to save the fiddleheads for tomorrow’s omelette, and made shirred eggs with shiitake, arugula, cheddar cheese and cream. Shirred eggs —baked in ramekins or muffin tins— make a delicious meal; perfect for entertaining a crowd at brunch. And with Mother’s Day coming up next weekend, I thought I’d share this recipe and give you a chance to practice before you making it for company (once you taste this delicious combination of flavors, you will definitely want to share). 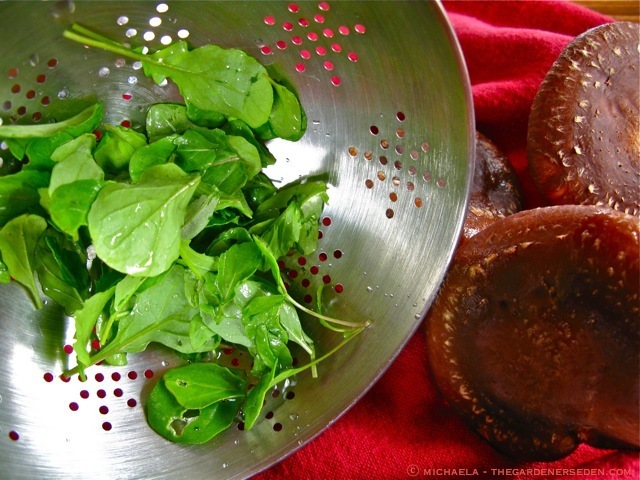 Earthy shiitake have a wonderful, rich flavor that works well with the fresh zing of baby arugula. But if you don’t have access to your own or locally grown shiitake (yet) you can substitute a different mushroom or vegetable of choice . 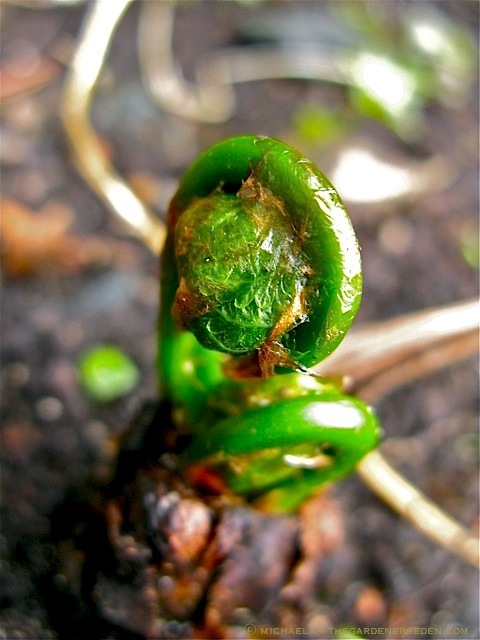 Have access to freshly foraged fiddleheads? 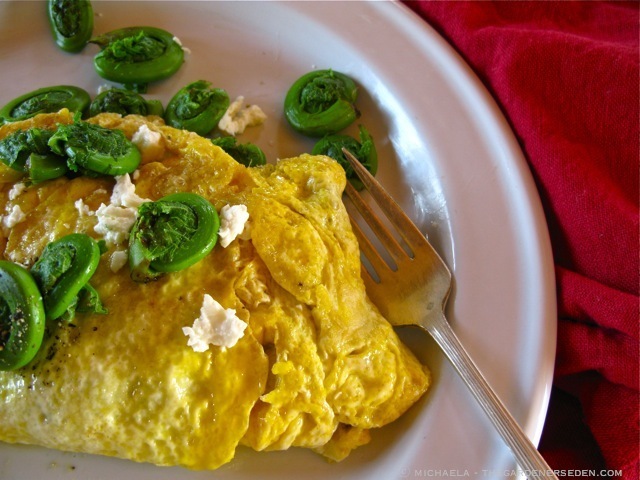 Perhaps you’d like to try the Ferncliff Fiddlehead Omelette, which I featured last spring in this post ( click here ). Generously butter 12 ramekins or 12 regular size muffin tins. At bottom of each container, add one tablespoon chopped shiitake mushrooms, approximately one tablespoon baby arugula leaves (torn into bits if necessary) and 1/2 tablespoon of cheddar cheese. Pat ingredients to settle them in, and (optional) add one tablespoon of heavy cream. Carefully crack each egg over the top of the other ingredients. 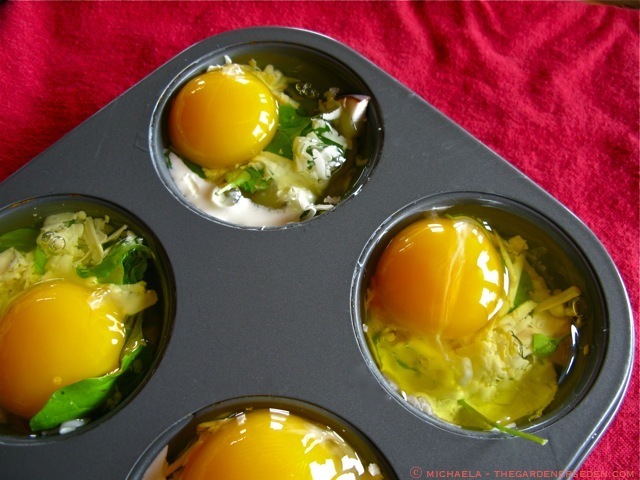 Place ramekins or muffin tins into the hot oven. Bake at 325 F for 10 minutes or until the eggs are just starting to set. Remove from oven and sprinkle each egg with 1/2 tablespoon of cheese. Return to the heat for approximately 2 – 3 more minutes or until cheese is melted. 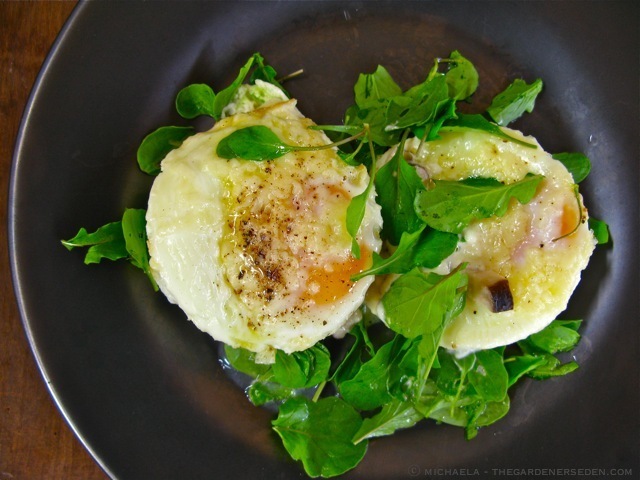 Meanwhile, arrange a nest of arugula greens on each plate. Remove tins/ramekins from the oven and gently scoop each shirred egg from its container with a rubber spatula or large spoon (it helps to loosen each container around the edge with the tip of a rubber spatula or butter knife). 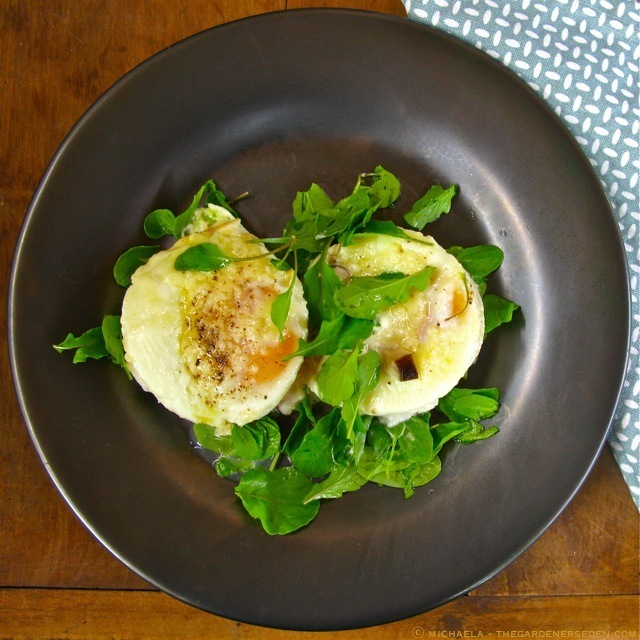 Settle each egg atop a bed of greens and garnish with a few arugula leaves, freshly ground black pepper & salt to taste. Serve warm. Article and all photographs are copyright Michaela at The Gardener’s Eden, all rights reserved. All content on this site, (with noted exceptions), is the property of The Gardener’s Eden and may not be used, reproduced or reposted elsewhere without written consent. Do you enjoy The Gardener’s Eden? 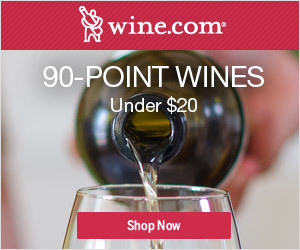 You can help support this site by shopping through affiliate links here. A small percentage of each sale will be paid to this site, helping to cover web hosting and maintenance costs. Thank you so much for your support! 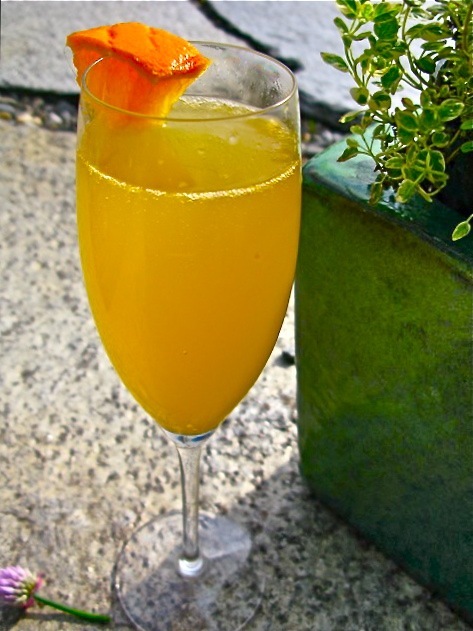 You are currently browsing entries tagged with Great brunch recipes at The Gardener's Eden.